Constantia is a small village with a great name and a great past. The villiage is Cleveland. It was named not after our twenty-second and twenty-fourth president, but after James Cleveland, who migrated from Petersboro, Connecticut in 1826. James Cleveland was a man of great initiative and immediately constructed a hotel and store which served as the nucleus of a growing community. industry. Born in Germany, where he learned his trade, he came to America in 1812 and began manufacturing glass at Vernon, in Oneida County, New York. When wood became scarce in Vernon, he moved to Cleveland with his four sons, and his son-in-law, George Cowarden. One of his sons, Harmon, is credited with creating some of the "off hand" pieces coming from the plant. The book," Landmarks of Oswego County" edited by John C. Churchill in 1859, describes Landgraff as "a man of pronounced ideas, active and influential in all public and private enterprises, and inaugurated many improvement in his art. He lived in advance of his time, and was more or less ridiculed for the theories he advocated - but since have been adopted." Anthony Landgraff chose Cleveland because of the thick strands of virgin hemlock surrounding the village. This was very important as enormous quantities of wood were needed for the furnaces. It was cut fine, about three feet in length and dried in ovens. The forest was so near that the choppers were able to pile logs against the drying house. In these days the accessibility of fuel spelled the difference between success and failure. thousand years is composed of a melted mixture of sand and two oxides from a group of four; soda, potash, lime and lead. Cleveland used a combination of sand, limestone, soda ash and carbon. Pieces of glass attributed to the earliest period have a definate green tint from the iron present in the sand. giant lens for the world's largest telescope atop Palomar Mountain.
" The melting furnace was about six by eight feet on the inside and the melting pots little larger than good sized water buckets.A single blower could and did carry and place them in the tempering oven." These first furnaces probably resembled a small pyramid with a great chimney at the top. feet deep. The cord wood was placed on grates over the pit. Approximately five feet above the grate were two shelves on which "the batch" was placed with holes so located that the blower could reach in for the gather. There were doors above and below the grate to allow removal of ashes and for stoking. Immediately above the Glory Hole, the furnace would slant up to an enormous chimney. messengers were dispatched to the nearby homes of the blowers who would immediately come and work until the supply was exhausted. dollar a box which was considered very good pay at the time. the Oswego County Historical Society in 1941, said, "The manner of selling the glass was in keeping with the character and primitive ways of small,local,independent manufacturers. In the middle of the century, Oneida Lake was connected by the Erie Canal by a side cut, and it was customary during navigation to load a canal boat with glass and peddle it out in the towns and villages along the canal from Troy and Albany to Lockport and Buffalo, often in the way of barter for store goods and other supplies." glass. The canes, pitchers, bowls, chains, etc that have been found and authenticated are "off hand pieces", meaning that they were produced by the blower after hours from the left over pieces. Miss Eggleson, whom we have just mentioned, was a collector of fine glass and illustrated her lecture with pitchers and basins that had been crafted by Cleveland craftsmen. These pitchers and basins were used on wash stands in the bedroom before the days of modern plumbing. George and Helen McKearin picture these on Plate 65 of their book, "American Glass". They write- "Washbowls and pitchers, smaller bowls and pitchers, milk pans, bottles, rolling pins, hats, with balls, and so on are included amoung authenticated specimens of Cleveland glass. They are characterized by the sturdiness of form and breadth of body and neck. The only decorative technique we have encountered is the threading of the necks of the pitchers." constructed chain of light green tint. These chains were sold to saloons where they were festooned over the bar for purposes of decoration. until 1861, when it was taken over by William Sanders, for a brief period before passing into the hands of H.J. Caswell and Crawford Getman. 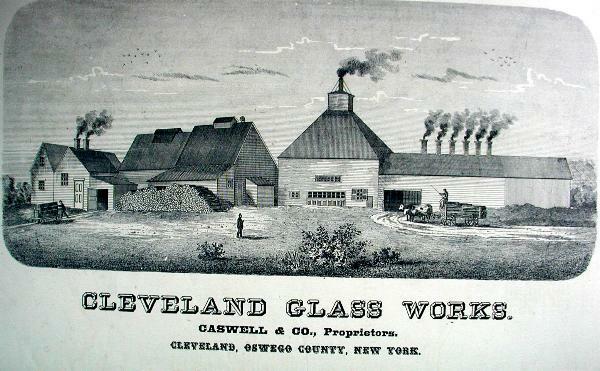 Child's Business Directory of Oswego County for 1866-67 carry the ad, "Cleveland Glass Works, Caswell and Company, Manufacturers of window, coach, picture, sheet, and double-thick glass, H.J. Caswell, C. Getman, Wm. Foster, F. Farmer." Crawford Getman had a large interest in this operation and continued in control after Caswell retired in 1877. A picture of the workers standing before the factory at this time shows a force of about seventy men. It is evident that Getman supervised the most successful glass manufacturing operation in the village. In July, 1869, the factory was nearly destroyed by fire and completely demolished on New year's Eve of 1881. Mr. Getman rebuilt a new and better factory on the same site. 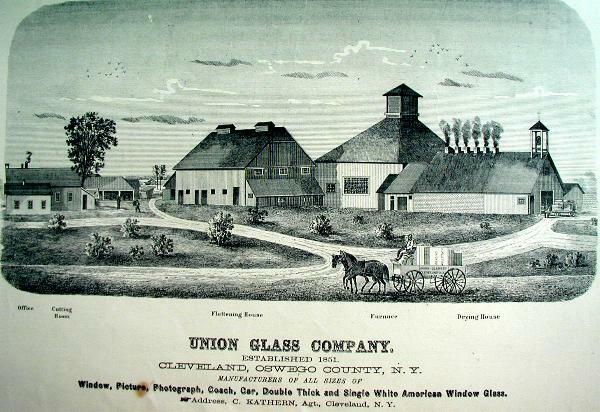 with success for more than twenty years, when it was sold to Crawford Getman in 1882, who ran it with his Cleveland factory until 1889,when he sold both plants to the United Glass Company. large and airy rooms. He also had a general store. The picture certificates were issued as pay to the workers and could be redeemed at his store. No one received actual currency for his work. Is it any wonder that Cleveland, New York was the birth place of our American Trade Unions. Frank Putney, a veteran of the Civil War, was secretary of the Cleveland Glass Company. He evolved a scheme of secret organization of workers. This was against the law but they held their meetings in a nearby ravine and exerted considerable influence in the factory. Mr. Samuel Gompers, who was then a young cigar worker, learned of the scheme and spent some days in Cleveland formulating ideas which ultimately gave birth to the American Federation of Labor. location for a small operation, using wood as fuel it was not the most advantageous location for the assembly line production. The changing seasons come and go, and today the halcyon period of 1834-1874 is but a memory. neighbors are using large pieces of "Cutlet" or waste slag, as borders for their flower gardens. The ruins of the Sand Street plant, once owned by Crawford Getman now houses a thriving oil business and people living within a few miles of Cleveland hardly believe you when you speak of it's past greatness. Copyright © July 2001 Mabry Benson Photos Union Glass Co. & Cleveland Glass Co.